This recipe was sent to me by Kristin who works for The Tennessean. Not long ago, they asked readers to send in brownie recipes. After the recipes were tested and photographed, staffers were invited to eat all the brownies. Kristin said that these brownies, which were submitted by Wanda Brown, disappeared first. I liked the way Wanda introduced and wrote the recipe, so I’m pasting it below as she wrote it. Without Wanda there to answer questions, I had to figure out a few things myself. Notes are at the bottom. I'm Wanda Thompson. Born in Nashville, living in Franklin, Tn. . Growing up in a wonderful, traditional Southern family, full of great cooks, I quickly learned from my mother, and both grandmothers, that sometimes you follow a recipe, other times make it your own. Being a dessert lover, I'm constantly experimenting, especially with anything CHOCOLATE ! I couldn't resist entering your "Brownie Recipe" Contest. This is a Favorite of mine. Hope you enjoy it too ! Preheat Oven 350 degrees. Grease a 12x8 pan (or a 13x9 inch). Combine the butter and both chocolates in a pan, and slowly melt on top of the stove. stirring frequently. Separately in a bowl, and using an electric mixer, add the remaining ingredients in the order given. Mix well. Pour the melted chocolate into the bowl and stir to combine. Pour into the greased dish. Bake for 25 minutes at 350 degrees uncovered. Then reduce heat to 325 degrees, cover with aluminum foil, baking 5-10 more minutes (depending on how hot your oven cooks). You want this gooey, but set. Let cool, and enjoy each delicious, RICH bite ! Pan Size: Wanda says 12x8 but I only had a 13x9 inch metal pan and it worked fine. Covering near end: Cover loosely – not tightly with foil. Frankly, I’m not sure why Wanda does this at all. I think maybe her oven runs hot. I did it anyway. Butter – I tested with salted butter because I figured that’s what Wanda used. If you use unsalted, you might want to add 1/4 to 1/2 teaspoon of salt to bring out the other flavors. I like brownies with a crusty, crinkly top, so I beat the eggs with an electric mixer until light and fluffy, then beat in the sugar and continued beating for about two minutes. I added the warm chocolate mixture to the fluffy egg/sugar mixture and proceeded as Wanda directed (added dry ingredients). I also rapped the pan really hard on the granite countertop before putting it in the oven. This, as I’ve mentioned, is supposed to bring air bubbles to the top and help with crinkles and cracks. I’m not sure if this is true, but banging the pan on the counter is fun. Nuts are a great addition to these brownies because they’re on the sweet side. Not in a bad way sweet (remember, they disappeared first), but sweet enough to work really well with a non-sweet component like nuts. Besides, it’s walnut season! I’m sure you have it but it probably goes by a different name. You might find it under 99% Cacao chocolate or if your “baking chocolate” doesn’t have sugar in it, then it’s probably just called baking chocolate. Just wanted to ask, I live in the UK and we don’t have “unsweetened chocolate” in our grocery stores. What is the UK equivalent – would you know? We have plain baking chocolate but I’m not quite sure that’s it. Would dark chocolate suffice? Thanks! These were incredible! I tried them a couple weeks ago and loved them which is saying something considering I hate making brownies and I’m not a huge chocolate person. I find so many brownie recipes are too grainy or not sweet enough or the wrong texture and just can’t stand up to brownie mixes. However, these are definitely an exception. Okay– I have a batch of these in the oven now, but i had to make some changes. I will let you know how it comes out. First, I thought I had unsweetened Baker’s squares, but, in fact, I have semi-sweet Baker’s squares. I cut the sugar down by nearly half. Also, I didn’t have enough Walnuts to be worth it, so I stirred in some Baker’s coconut– I love coconut in brownies. I also halved the recipe and am baking it in a shallow round cake tin. I miss my American pots and pans!!!!!! Being an expat is fun, but the baking sure is a challenge! Not that it appears to be too much of a challenge to please my new co-workers when it comes to baked goods, but these brownies were very well-received! People are fighting over them. Thanks for the recipe! Emilie, I think the walnuts are pretty too. They kind of sunk in this time, but they still look nice. Barbara, what kind of brownies did you try in Chicago? Do tell. Sarah, dropping sounds fun but kind of dangerous….which makes it more fun. Lisa, the peanut butter brownies are delicious. Then again, that’s no surprise since it’s a Dorie Greenspan recipe. These look very good, and they originated righ here in my hometown! Actually, I think for my next brownie recipe, I am going to try the Dorrie Greenspan chocolate peanut butter brownies you have on your top ten list. I ALSO quite enjoy a crusty-topped brownie and banging pan before baking, but I usually just drop the (metal) pan onto the floor. Dropping things on purpose is fun! Kristin,glad to hear the unsalted butter was fine. I think I’m too sensitive to salt levels. Or maybe I just LIKE salt. Therese, you’d better bake those brownies right away. Amelia, that’s interesting to note. In this recipe, you put the foil over the brownies then throw them back in the oven at a lower heat for 5 minutes. I guess the foil just protects the edges. Whenever I make brownies I always put aluminum foil tightly over the top as soon as they come from the oven. This prevents the ends and corners from getting dry. I know what I am having for supper…french fries and brownies!! It’s PMS time at the Bishop home!! tee hee! 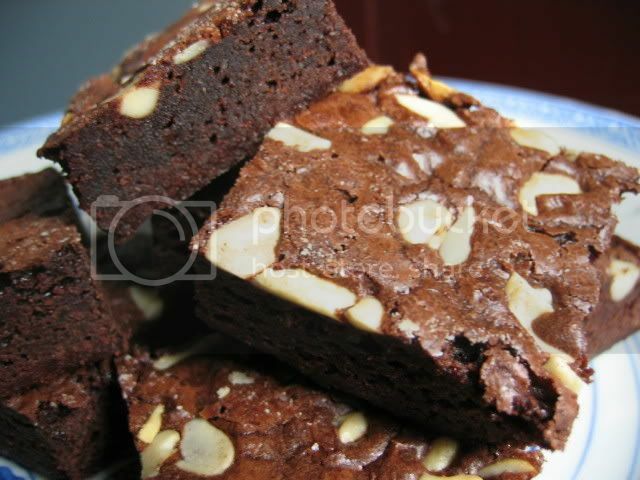 These brownies look so yummy! They’re worth it for sure, Deb! For what it’s worth, when I test baked them I used unsalted butter, and they were amazing. I covered them, per Wanda’s instructions, but only very loosely covered. I also used a 13×9 pan. Does 12×8 even exist? Glad they turned out for you, Anna! Hello, Anna! I’ve been lurking on your blog for a while now and keep wanting to post – now you made me! I have been having a huge brownie craving for the last few days. 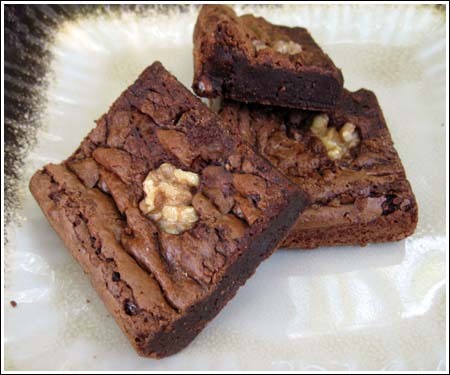 Last night I made “Moosewood Fudge Brownies” that I have heard are outstanding (and are pretty good, but these look soooooo yummy, I might have to make them right now! I love the blog and keep stealing recipes – guess you can’t call it stealing if you are sharing them! Thanks for the great blog!! !